Fishy beaches. The picket line. The bar with the veggie dog, beer, and shot deal. Monsoon season in the Southwest. Reading Nightwood and then wrestling with her dog. The dog's musk. Her therapist's office. Hearing a friend kill it at a reading. The N5 at Xi'an Famous Foods. The karaoke bar up the street whose limited offerings include several Kate Bush songs. The mountain in Montréal. The smell of mint. Such are the faves of Liz Bowen, a poet and graduate student living in New York City. I first encountered Liz's work through the Metatron family. Her poetry collection, Sugarblood, was published by the Canadian press in 2017. As I became more familiar with her social media presence, what I truly admired was her compassion and commitment to her dog Rose. She says she's learned "a hell of a lot about how race and class hierarchies transcend species bounds" since she's been living with a pit bull on the notoriously wealthy Upper West Side. I asked Liz if she would be interested in an interview so I could learn more and share her insights. "I love connecting with nonhuman animals more than almost anything else," Liz shares. "It's embarrassing, because a lot of people think loving animals is apolitical, and I know those arguments well. But I really disagree. I've learned so much about trauma, both human and nonhuman, by working with an abused rescue dog." We're both interested in communication that doesn't depend on language. I personally value reflections of this nature because my brother has autism and has been classified as non-verbal in a society that has the tendency to promote a false dichotomy in which verbal expression is the marker of "functionality." "I love the kinds of communication that humans and other animals make up together that don't depend on language," Liz asserts. "Especially given how much of my professional world privileges language as the ultimate signifier of human superiority. What a joke! My dog doesn't have language, but guess what, she's not destroying the world either." In a recent commentary on the film A Quiet Place, Liz prompts us to examine how auditory normalcy is “no longer prized, commodified, or even useful” in a fictional world where humans struggle to survive by means of silence and sign language. Because the family in the film “has accommodated one person’s needs in the pre-apocalypse world,” Liz writes, “they all are equipped with the tools to survive beyond it. This is the promise of universal design in its most extreme application, and an answer to the questions most of its proponents don’t dare ask: How do we even think about disability, a category defined by access to one’s environment, as we face radical ecological change that may render those environments unrecognizable?” [Read more here]. By exploring these questions, I think Liz is actively making the world a better place. 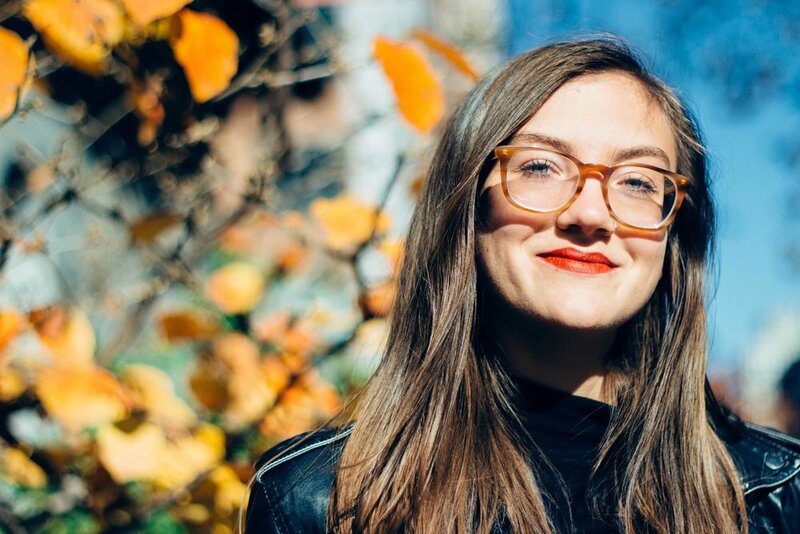 Through experimental poetry, she's interested "not just in how language keeps us subjugated and miserable, but in how it can help us imagine alternative worlds that are more interested in survival and ethical thriving than this one." If there's one adjective I would use to describe Liz, it would be inclusive. It took her ten years to identify as disabled because of the way she'd seen disabled people mocked and stigmatized at her primary schools, and now her work is quite focused on disability and illness. "Though this process has made for some traumatic experiences," she admits, "I am grateful for the kinds of revelations I have undergone as a person who learns to embrace an identity after having renounced it for so long. I put my body through so much abuse and neglect because of the way I'd been taught to revile difference and abnormality, but at the same time, the process of learning to embrace and care for those differences is integral to who I am as a person, and especially as a writer. Not everyone gets to go through a fundamental shift in how they understand their body and its needs. I'm grateful for that process, even if I had to endure a lot of pain and alienation to get there." When I ask her how she is affected by capitalism, she tells me, "It decides how I can or can't take care of my illness. It charges me money for not having enough money. It brings out the ugly kind of Capricorn in me, the part that can never have enough external validation for my work. It makes me cry in airports, every time. It makes me feel like a rat in rooms full of rich people who are supposed to be my peers. But it also brings me into communities—whether local, professional, artistic, or mass/public— hellbent on imagining its end." The twenty eight year old deeply enjoys doing whatever she can make the cultural aristocracy a little less comfortable occupying the same old dusty upholstered thrones. "Though not just in academia," she reminds me. "Sometimes the thrones are millennial pink and located in an exclusive 'feminist' co-working space. Gotta stay vigilant." I realize that she is speaking about The Wing, an artificial and deceiving place in New York City. RS: You grew up in rural Maryland. Did the environment in which you grew up affect you and your work? LB: Oh, boy. Yes. I grew up in a punishingly conservative place, where evangelical Christianity, by-the-bootstraps individualism, military hierarchy, confederate romanticism, and white male resentment combined to make my life as a mostly-invisibly disabled, quietly queer, not-so-quietly feminist teenage girl totally rough. (Which is to say nothing of how rough it would have been if I hadn't been white.) And rage-inducing. RS: So your rage comes from your hometown? LB: People have come up to me after readings and told me my work is angry, even when I've read things that I don't really perceive that way. My anger is rarely directed at the place I grew up, anymore, but it is still where I learned to have rage—where I learned rage as a survival tactic—and so in a sense all my politics as well as my aesthetics started there. I'm glad they've moved elsewhere, over the years, but I think the rage will always be, in part, the rage of a girl who's told she isn't allowed to ruin the lives of racist old predators who work in churches and schools. RS: What do you think young artists need? LB: The internet, especially if they don't live in cities. I'm grateful my parents let me spend more time talking to strangers online than seemed healthy because I'm not sure I would have survived adolescence otherwise, let alone started writing the way I do. RS: What do you want people to know about their post-graduate options? LB: When I graduated college, I wanted to go to grad school but thought I'd never be able to afford it, and I didn't know that PhD programs are fully funded. I worked for years doing copy editing work that I hated, and then got back in touch with a former professor who let me know that I could spend at least five or six years doing literary criticism without bankrupting myself, with the potential of doing that work for the rest of my life. This is now something I tell everyone I meet who is smart and not rich: Don't apply for the master's — the cash cow for the corporate university — just because you have been led to believe the PhD is out of your financial league. Apply for the funded PhD. You can drop out after you get the master's, if you want or need to, and you won't have to take out a single loan. RS: Can you comment on the tension between excess and constraint present in your work? LB: My work used to be all excess, a kind of bleeding of all the bad language and feeling that the external constraints of ableist heteropatriarchy had instilled in my brain and mouth. I've found, since, that limitations and boundaries can be beautiful, life-giving things when you get to choose them yourself. Whether poetic or personal, boundaries are all about finding the form that best suits what you have to offer. So lately I write long forms, like sestinas and crowns of sonnets. Like I do with my relationships, now, I let my poetic tendencies toward excess settle in to a comfortable set of expectations, always with the potential for renegotiation. RS: What are your “rule for friendships” these days? LB: Boundaries. We have them, we talk about them, WE TALK ABOUT THEM, we update them as needed. It has taken me twenty eight years to get to a place where I’m not afraid to be honest with others about my capacities as a giver and receiver of care, and to expect the same from them. It totally floored me when a new but close friend texted me one day to tell me they adored me platonically and had no desires or expectations beyond that. I thought, how lovely? What a relief? Why don’t I just express these things with clarity in all of my relationships? So I’ve been trying out versions of that, and seeking out people who don’t think it’s weird or corny to ask, “Does this conversation feel okay to you?” I’ve made a lot of new friends as I’ve transitioned into this set of standards, and I feel safer in, prouder of, and more seen by my communities than I ever have before. RS: That’s wonderful! Who are your favourite artists right now? LB: I'm just going to list poets/writers who are alive and whose work I believe should be supported in this moment: Carrie Lorig. Marcela Huerta. Natalie Eilbert. Chase Berggrun. Raquel Salas Rivera. Anaïs Duplain. Never Angeline Nørth / Møss Høpe Ångel / Moss Angel the Undying / Moss Angel Witchmonstr. Vi Khi Nao. Christina Olivares. Ashley Obscura. Kayleb Rae Candrilli. Lara Mimosa Montes. Khadijah Queen. Caroline Rayner. Jasper Avery. Nabila Lovelace. Tatiana Luboviski-Acosta. Jayson Smith. Sennah Yee. Wendy C. Ortiz. Demian DinéYazhi´. Simone Savannah. RS: What psyches you out or makes you think too hard? LB: Karen Barad writes about a concept in quantum field theory called vacuum indeterminacy, in which there is such a thing as a vacuum, but its energy cannot actually be determined to be zero and therefore it can't be determinately empty. As she puts it in an essay called Transmaterialities, it's a matter of the void "not being nothing (while not being something)," while it still "may in fact be the source of all that is." It really takes all that stonery anguish over the nature of pre-big-bang nothingness to a whole new level. RS: What makes you laugh? LB: Aries and Leos. That guy on YouTube who feeds fruit to the deer around his house. Rihanna riding side saddle on the jet ski. Jenny Slate. Goats, my god.